The Irish will welcome over 50 majestic Tall Ships from 12 countries, some 1,400 sail trainees and an anticipated 500,000 maritime, music and festival fans to the quays of Waterford City this weekend for the biggest party of 2011. Tourism Ireland has ramped up its US marketing campaign to coincide with President Barack Obama’s visit to Ireland, which is expected to generate huge publicity in the US. Hundreds of international journalists have been accredited as part of the visit, with Tourism Ireland using the visit to leverage awareness in the US. The Queen has concluded her state visit to Ireland by visiting two of the country’s most popular tourist sites, the Rock of Cashel, followed by Cork’s historic market. The first two days of her visit focused on the “troubled past” between Britain and Ireland, and she offered her sympathy to those who had suffered during the conflict. Republic of Ireland finance minister Michael Noonan has confirmed the controversial €3 air travel tax will be abolished. Noonan said VAT on restaurants, hotels, cinemas, theatres, sports fixtures and other attractions would also be cut from 13.5 per cent to nine per cent as the nation sought to boost tourism receipts. Tourism Ireland is the first national tourism board in the world to launch a social game. It taps into the huge popularity of games like FarmVille and CityVille. Ireland Town will sit on Tourism Ireland’s Facebook pages. Airport operator BAA has urged the British government to follow the lead of Ireland and rescind recent increases in air passenger duty. Yesterday the Irish government announced it would cut its Air Travel Tax to €3 from its current rate of €10 despite the ongoing financial crisis. Dublin Airport welcomed the opening of Terminal 2 over the weekend, but what was once a monument to Irish prosperity is in danger of becoming a symbol of economic overreach. At its peak the project was the largest construction site in the state, employing up to 2,600 workers on site. But many of these jobs have been lost, in line with thousands more across Ireland as the recession bites. Swedish ferry operator Stena Line has confirmed it is to invest approximately £200m in a new ferry port in Scotland. The Loch Ryan port will occupy a 28-acre site two miles north of Cairnryan, following the Scottish parliament’s decision to grant a Harbour Empowerment Order (HEO) allowing construction. Tourism Ireland has launched a new campaign which aims to increase visitor numbers from the UK to the island next year. The new strategy, launched at World Travel Market yesterday with comedian Patrick Kielty (pictured) and the cast of Riverdance, will target both business and leisure visitors. 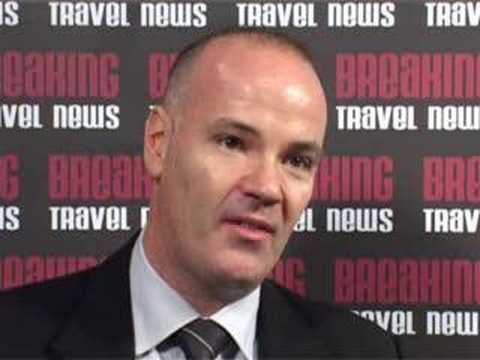 Breaking Travel News interviews Simon Gregory, Director Band Development & Markets, Tourism Ireland at World Travel Market 2007 on the promotion of the whole island’s tourism product as well as the growing interest in Northern Ireland.